As a new resident, it can be difficult to decipher where to find information on which entity performs what functions throughout our community. This may be different depending on whether or not your residence is located within the city limits of San Marcos. Some of the areas that were developed first are located in the San Marcos ETJ (extraterritorial jurisdiction) but it is frequently referred to as “living in the county”. This is helpful information that we think you may need. Water– There are two providers of water in our neighborhood. If you were not provided this information when you moved in, we suggest that you ask a neighbor who provides their water. The two water providers are: City of San Marcos Utilities (512.393.8383 or http://www.sanmarcostx.gov/) and Crystal Clear Water Supply (830.372.1031 or http://www.crystalclearsud.org). You should contact the provider for instructions on setting up your service. 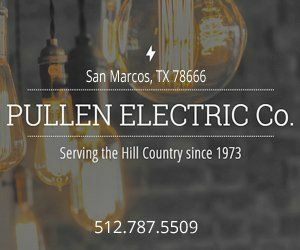 Electric – The electric provider in our neighborhood is Pedernales Electric Cooperative (PEC). Contact PEC at 888.554.4732 or 512.262.2161 or http://www.pec.coop. Also, SaveOnEnergy.com is a website that helps residents compare multiple energy suppliers to find the best plan for them. City of San Marcos residents – Trash and recycling services are provided by the City of San Marcos. Texas Disposal Systems is the provider; however, you must arrange for services through the San Marcos Utility Services (512.393.8383 or http://www.sanmarcostx.gov). They will provide you with a schedule of services. Please place your trash out the night before or early on the day of service, and bring the containers back in the day of trash pickup. County or ETJ residents – You may contract with the private servicer of your choice. Please place your trash out the night before or early on the day of service, and bring the containers back in the day of trash pickup. Additional useful contact information can be found on our Community Information page. We hope you enjoy living in our wonderful community. Our volunteers and residents work hard to make this a special place to be. 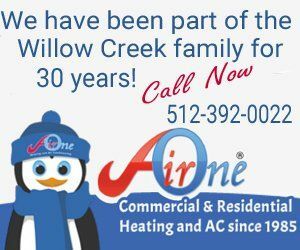 Thanks for choosing Willow Creek!